May prevent age-related decline in cognitive function (attention, memory). Key nutrients for protecting the heart, brain and red blood cells. We have already discussed in detail the exceptional properties of pyrroloquinoline quinone (PQQ): It is an ultra-powerful antioxidant, up to 5,000 times more effective than vitamin C. It is the only nutrient capable of generating new mitochondria – up to 20% more, in existing – even aging - cells. It uniquely ensures protection for mitochondrial DNA, which is particularly exposed and vulnerable to oxidative stress. This new dietary supplement offers the synergistic effects of pyrroloquinoline quinone (PQQ) and co-enzyme Q10 (CoQ10). Extensively studied in recent years, these two compounds offer significant antioxidant potency. They are thus able to combat oxidative stress – the result of attacks on cells by highly reactive species. The best-known of these are free radicals which contribute to premature ageing of cells as well as the development of certain age-related disorders such as cognitive impairment. The good news is that antioxidants are available which can fight the effects of free radicals and protect cognitive function. These include PQQ and CoQ10. PQQ – or to give it its scientific name, pyrroloquinoline quinone – is one of the most powerful antioxidants currently known. It has the advantage of having good molecular stability which makes it highly effective at fighting oxidative stress. Its antioxidant activity is particularly beneficial for protecting mitochondria, the cell structures essential for energy production. In addition to this protective role, it promotes new mitochondrial growth. Coenzyme Q10 features in the composition of a number of anti-ageing formulations. In helping to protect the body against free radicals, coenzyme Q10 helps prevent premature ageing of the cells and the onset of certain age-related symptoms. In addition, this powerful antioxidant works within the mitochondria for the production of adenosine triphosphate (ATP). The main energy source for numerous cellular functions, ATP is essential in order for the body to function properly. Despite this critical role, the body’s ATP reserves are very low and need to be constantly renewed, hence the importance of coenzyme Q10 for maintaining vital and cognitive functions. 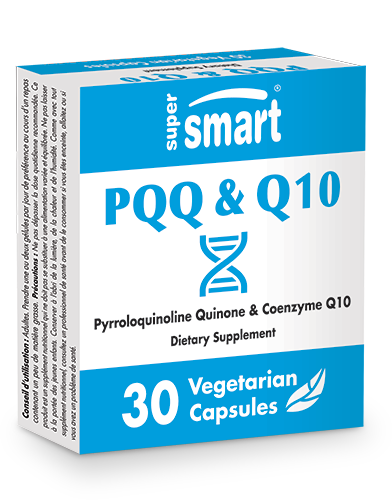 Often recommended individually, PQQ and CoQ10 are combined in this supplement to take advantage of their synergistic effects. Indeed, recent research has shown that combining them in this way may strengthen their protective role against oxidative stress. These studies suggest that their antioxidant effects may be particularly enhanced in the cardiovascular and nervous systems. As a result, PQQ and CoQ10 are today associated with protecting the heart, red blood cells and brain, as well as preventing age-related problems such as memory loss and concentration deficit. The suggested dose for this PQQ and CoQ10 supplement is two capsules a day. Other powerful antioxidants may also be of interest for fighting age-related cellular damage such as resveratrol, the natural antioxidant found in grapes and red wine. For optimal efficacy, this protective compound can also be combined with other antioxidants such as in the synergistic formulation Resveratrol Synergy. Taken together, PQQ and CoQ10 improve antioxidant status and mitochondrial health via complementary mechanisms. They also provide multi-faceted support for cardiovascular and cerebral function. They improve mental condition and quality of life in elderly patients and may be beneficial in delaying or preventing cognitive decline in middle-aged individuals.